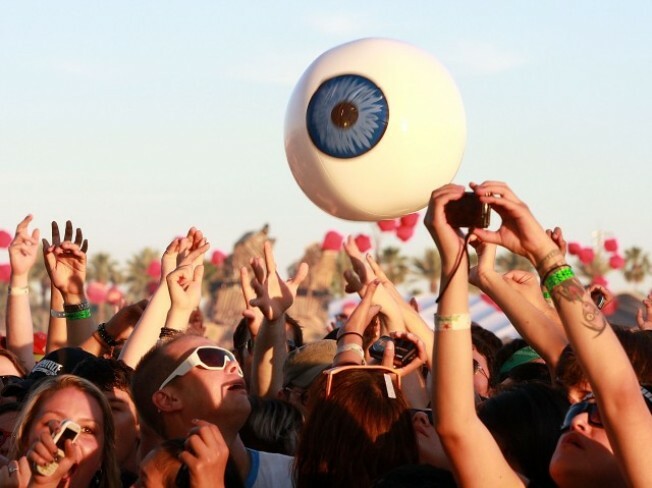 Coachella announced the 2011 festival line-up on Tuesday, Jan. 18. "Indio in April" sounds like a ballad that could have been recorded by some poolside-living Rat Packer back in the midcentury years. And it is a song, in a way, but one made by dozens of acts and major artists with about as much variation as the word "variation" will permit. That particular song will play over the April 15-17 weekend at the Coachella Music & Arts Festival, which is, you might have heard, one of the planet's largest rock-it-out parties. And on Tuesday, Jan. 18, the fest's organizers hit "send" on the spread-the-word tweet on just who exactly is going to come assist in the rocking-it-out. The oversized bold names, by date: Kings of Leon on April 15, Arcade Fire on April 16, and Kanye West and The Strokes on April 17. Other acts over the three days include The Black Keys, Mumford & Sons, Chemical Brothers, PJ Harvey, Duran Duran. Surely, in all corners of the internet, discussions are going down on who might have returned but didn't and who exactly is making a surprise and welcome showing. But isn't that half of what Coachella is, at least ahead of the weekend itself? The chitchatter? The rumors zipping hither and yon? It adds to the Coachellaness of it all, in a good way. Best follow this tweetery for updates and ticket info. Only three months to get that tent lined up, or that one friend's cousin's house near that one place. Chitchat away, Coachellans, but best start getting organized, too.